Have a look at the page "Magazines, Theses, and other", too (link). 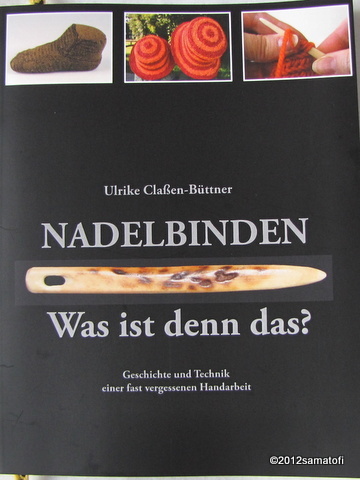 Quite a few web shops sell nalbinding book(let)s in English, for example Mielke's Fiber Arts. Sljödmagasinet sells nalbinding books in Swedish and Danish. 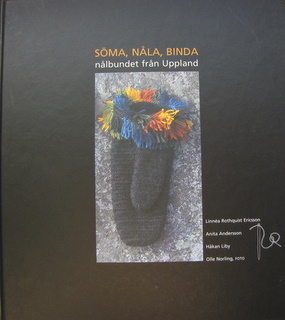 Many of the beautiful, abundantly embroidered Swedish nalbound mittens can be seen in colour photos in these books. Payment via PayPal, or via IBAN bank account number, if your country uses them. Nalbinding books also in the Bokbörsen. Same text and photos as in the book "Käden taidot 4" below. Finnish Stitch 2+2, drawn instructions/diagrams how the yarn goes under-over, instructions are without thumb (flat). Also stitches Finnish Stitch 2+3, Finnish Stitch 3+3, and Russian Stitch 2+2+2, Russian Stitch 3+2+2, Russian Stitch 3+3+3, and Finnish Turning Stitch are mentioned, but instructions are not included. Russian Stitch 2+2+2 F2, diagrams are without thumb (flat), but the use of thumb is explained. The Russian Stitches can be done in several ways, and these instructions differ from other instructions given on this web site. The thumb is used, but the needle and yarn are pulled through in the middle of the stitch. Russian Stitch 2+2+2 F1, without thumb (flat). In the text it says incorrectly "... ns. kaksivaiheinen työtapa" (2-phased stitch, ie Finnish Stitch Family); but the instructions show a 3-phased stitch, ie a Russian Stitch. On page 43, there is an error in the arrow which shows how the yarn goes under-over. Russian Stitch 1+2+2 F2 (Polvijärvi Stitch), without thumb (flat). Russian Stitch 2+2+2, without thumb (flat). Russian Stitch 2+2+2 F2, without thumb (flat). Also have a look at the "Magazines, Theses, and other" (link), and the other books below. 40 pages, black and white photos, drawings. Available from Serge ja Marquita Volkenilta, Gentle Craft Publications gentle.craft(at)vtxnet.ch. In 5/2015 price was 22 CHF plus postage. 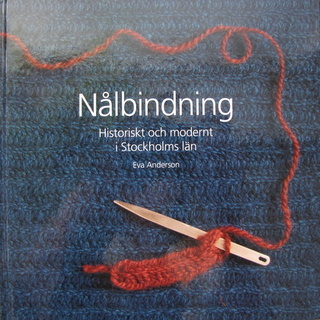 Total 19 nalbinding stitches, history of nalbinding, needle, yarn, splicing, a couple of different ways of making the first loops, information e.g. about the structure of different kinds of mittens and socks. 116 pages, soft cover, bit smaller than A4 size, lots of colour photos, can be ordered at least via Amazon. Note, the English version is available in colour print (Amazon.de) and in black&white print (Amazon.com, Amazon.co.uk). The book is a "book on demand", meaning it will be printed only when ordered, so although the stock shows 0 pcs, you can still place your order. Instructions with colour photos for Oslo Stitch, Mammen Stitch, Brodén Stitch, Dalby Stitch, York Stitch, and diagrams for a few other stitches. Also includes bilum (a netted bag from Papua New Guinea), splicing (several ways), history, catalogue of nalbinding finds in different eras, both b&w and colour photos of historical nalbinding items. Instructions on making one's own needle, choosing yarn, patterns for pouches/bags of different size, mittens, socks, etc. 1 stitch is shown, diagrams of 3 other stitches are included, black and white photos, general information and history of nalbinding, A5-sized, 69 pages, basic information like increasing, decreasing, leaving thumb opening, pivoting (turning at the corners), etc. 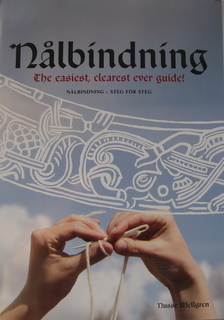 1 stitch is shown (Åsle), diagrams of 2 other stitches included, step-by-step drawings, A5-sized, black and white booklet, 42 pages, general information and history of nalbinding, and similar type of information as in the Nalbinding Made Easy booklet. Diagrams for the following stitches: "open (free) buttonhole stitch", "twisted buttonhole stitch", twisted buttonhole stitch with extra twist (Fig. 302), "mesh stitch" (Coptic Stitch/Tarim Stitch), Skrydstup Stitch (which is more like an embroidery stitch than actual nalbinding), O/UO F2 (Danish Stitch), UO/UOO F1 (Oslo Stitch), UOO/UUOO F1 (Mammen Stitch), UOU/OUOO (Dalby Stitch), Åsle Stitch, Dalarna Stitch, UOOOO/UUUUOO F1 (Långaryd), UUOOOO/UUUUOOO (Östra Göinge), UUOO/UUOOO (Finnish Stitch 2+2), UUOOUUU/OOOUUOOO (Russian Stitch 2+2+3, ie Salmi Stitch; in the text there is an incorrect reference to the Tuukkala mitten); UOOO/UUUOO (Brodén Stitch). 154 pages, a map of Nordic countries marked with different stitches in different places. In his book Nordland uses the notation system developed by himself. The system is explained in the beginning of the book. It is worth getting familiar with his notation system because that helps reading and understanding the book. For example Oslo Stitch (aka Finnish Stitch 1+1) is UO/UOO in Hansen's Notation, but 4(12) (or 4.12) in Nordland's system. But if the connection stitch is F2, the Nordland's code changes to 4(11) (tai 4.11). “Nålebinding definition and description” Egon Hansen, 6-9 May, 1987. Hansen's article is 7 pages long. This book is written in two languages, Danish and English, and it seems to be a kind of a tribute to Egon Hansen and his work. Hansen died in 1989, and his nalbound items and notes were in a box untouched for 25 years until the writer of this book, Marianne Overby, got his nalbinding materials from his daughter. 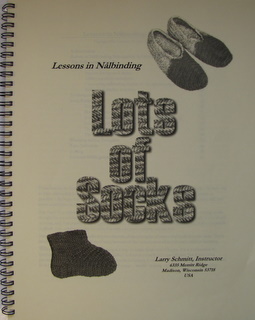 The book includes Hansens foreword from 1987, his biography in short, history of nalbinding, several diagrams of different nalbinding stitches, plenty of black and white photos of Hansen's original nalbound items and patterns for them (hats, mittens, socks, pinafores, pullovers, bags, scarves), and the book also clarifies the so called Hansen Notation, and includes basic things (needle, material, splicing, etc). In his work Egon Hansen seems to have favoured stitch types which I would describe with term mirror image (for example in Mammen Stitch the needle goes "under one - over two", while in a mirror stitch the needle would go "over one - under two"). 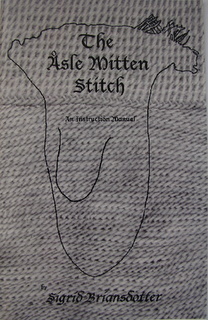 In the stitch index included in this book there are a few differences in stitch names compared to those used by for example Schmitt. This may cause confusion, so I would recommend looking at the notations, too, rather than only the stitch names. 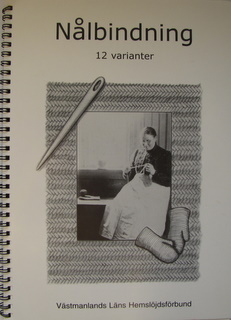 One stitch is shown (Brodén Stitch), instruction drawings, general information on handling wool and felting, history, photos of old items, increasing, decreasing, pivoting (turning at the corner), easy outline-patterns for mittens, the so called Klas-Brita sock pattern (by a Swedish nalbinder Brit Persson, from Gävleborgs län, Delsbo, 1884-1963), and also easy patterns for hats and scarves. In addition to the so called Brodén Stitch, there are also written instructions for Finnish Stitch 2+3 F2 (also 2+4 F2 mentioned; "Finnish hat" by Anna Äikas), and written instructions plus a diagram for Russian Stitch 1+1+2 (Oulu Stitch). 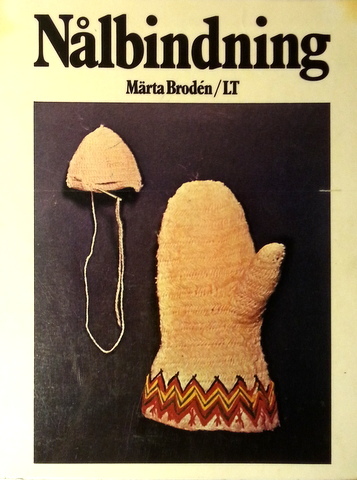 *drawings, general information on handling wool and felting, history, photos of old items, increasing, decreasing, pivoting (turning at the corner), easy outline-patterns for mittens, the so called Klas-Brita sock pattern (by a Swedish nalbinder Brit Persson, from Gävleborgs län, Delsbo, 1884-1963), and also easy patterns for hats and scarves, cape/poncho, hood, cowl, two kinds of pullovers. Compared to the previous edition in 1973, there are more patterns and photos included in this newer edition. The contents of this book is basicly the same as in the nalbinding chapter in the older book Gamla textila tekniker i ull. 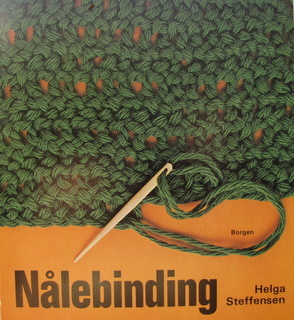 Both books introduce the same nalbinding stitches. 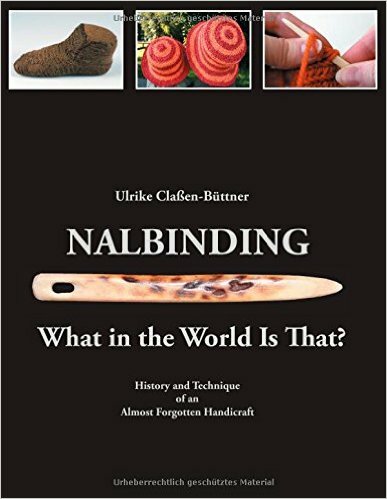 In addition, the new book talks about the history of nalbinding, materials, and gives general advice, for example, how to splice. The stitches by Britta and Tora are the same, Brodén Stitch, but the loops are manipulated in a bit different way, so maybe that's why they have been calculated as two separate techniques. Stitch by Svea is Finnish Stitch 3+3 F2, and stitch by Maj is Dalby Stitch. Also Åsle Stitch is shown. In addition to these, there are diagrams of for example Tarim Stitch (Paracas Indians' technique), and Buttonhole Stitch and its variations in which the loop is twisted in different ways. Diagrams to show how to start, pivot (turn at the corners), make thumb, splice, etc. Instructions for Brodén Stitch, Finnish Stitch 3+3 UUUOOO/UUUOOO F2, Dalby Stitch (also mentioned that one can pick up three loops behind the thumb instead of just two, but it is not specified whether that means 1+2+1 UOOU/OUUOO (Kitee Stitch) or 1+1+2 UOUU/OOUOO (Oulu Stitch), Åsle Stitch, Skrydstrup Stitch (which actually is more like an embroidery stitch and not an actual nalbinding stitch), buttonhole stitch, a nameless stitch U/OO. 30 pages, spiral bound, A4-sized, results of the nalbinding survey in Västmanslän in Sweden in the 1980's, black and white photos. Instructions with photos for 12 stitches, and in addition, at the end of the book written descriptions for 6 other stitches (actually 11, but some of them are the same as in the beginning of the book), basic instructions like increasing, decreasing, thumb, outline-patterns for mittens of different sizes, and for socks, etc. 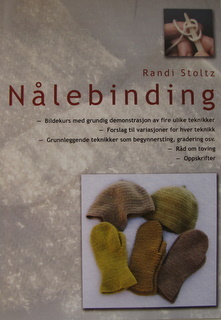 56 pages, hard cover, results of the nalbinding survey in Stockholm area in Sweden. 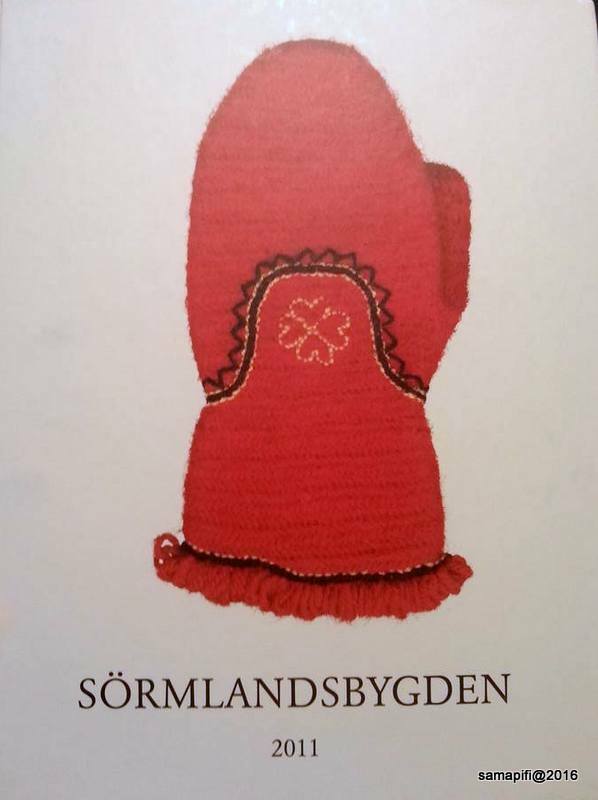 Short, written instructions for 7 stitches, a few drawings, interesting colour photos escpecially about the mittens abundantly embroidered in the Swedish style. 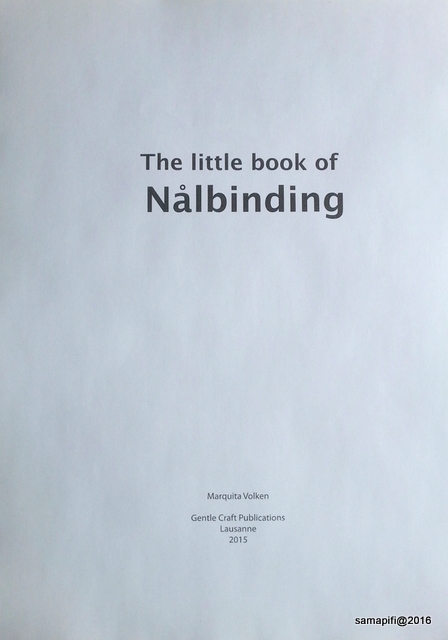 87 pages, hard cover, results of the nalbinding survey in Uppland area in Sweden. Short, written instructions for 14 stitches, a few drawings, interesting colour photos, outline-patterns for mittens in different sizes (smallish sizes). Sample mittens/hats made of every of those 14 stitches, but some of them are made of such a dark yarn the surface doesn't show. Familiar stitches with different names (Swedish names), Oslo Stitch, Brodén Stitch, Mammen Stitch, Danish Stitch, Finnish Stitch 3+2, FS 3+3, FS 1+2½, FS 1+1½, but also a few quite a different ones, too. 15 pages, via Grävlings Naturprodukter (link). Diagrams for Coptic Stitch (Tarim Stitch), buttonhole stitch, twisted buttonhole stitch, Oslo Stitch, Mammen Stitch. 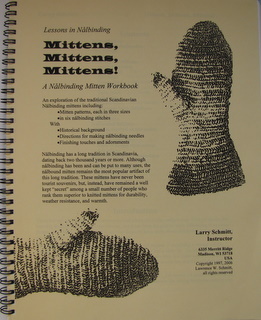 More detailed instructions for Oslo Stitch, instructiosn for making mittens and socks, splicing, etc. 33 pages, a paper copy can be bought at Korps/Ravencraft AB:sta (linkki). A free version (pdf), which cannot be printed, nor saved, and which is missing the updated sock chapter, on Spångmurs web site (link). 90 pages, hard cover, available at least via Slöjdmagasinet. Dalby Stitch is introduced briefly, but it is assumed the reader already knows nalbinding, since it is not shown how to start, how to decrease, etc. 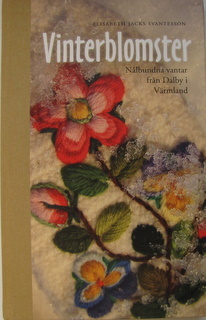 The book is full of amazing colour photos of different Dalby mittens (dalbyvantar) with abundant floral embroideries. 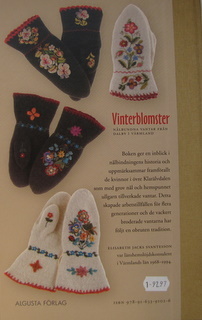 History of Dalby mittens is introduced, as well as older nalbinders. 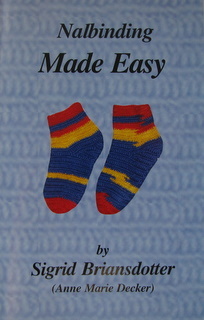 It is said in this book that the basic technique for Dalby Stitch is always the same, but the number of the loops to be picked up behind varies (sic). On another page it is said that one can pick up either one or two loops from behind, and I am assuming this means the actual Dalby Stitch 1+1+1 UOU/OUOO, and a thicker version 1+1+2 UOUU/OOUOO (Oulu Stitch). In some photos the typical surface structure of the Dalby Stitch is clearly visible, but some of the mittens seem like they may have been done in some other nalbinding stitch. 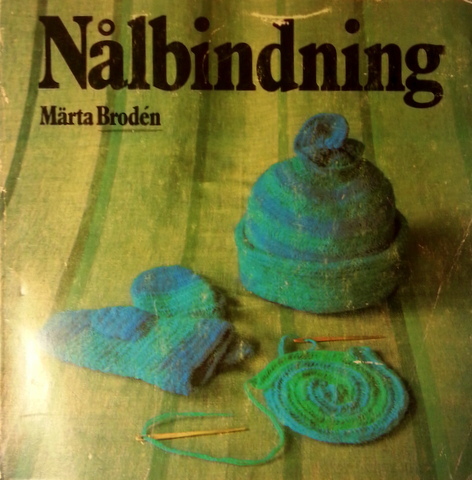 In the book there is a chapter about nalbinding, and it introduces three different nalbinding stitches used in the Södermanland's area (Sweden): Varsta, Näshulta and Vad. 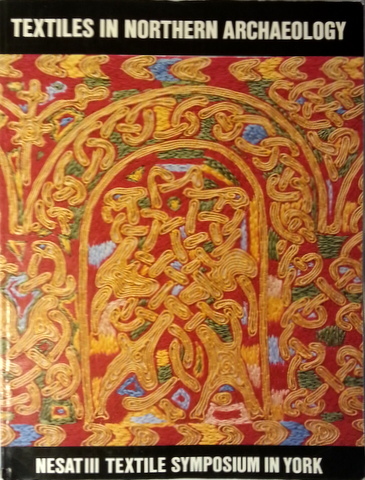 Varsta Stitch is the same as in some of the old nalbinding fragments found in Turku (Finland) from 14th-15th century, that is, OOO/UUOO F1 (Hanna Martikainen's Master's Thesis, 2015). Näshulta Stitch is one of Turning Stitches version 2, 1+tl+3 F2, and Vad Stitch is similar to Saltdal Stitch except that the connection stitch is picked up on the reverse side, just below the top edge loop, UUU/OOOU reverse M1. 39 pages, soft cover, bit larger than A5-size, square shaped, black and white photos, drawings. Instructions for five (?) nameless stitches, all of which are done without thumb (flat). Nålebinding - Opsamlingshæefte - de første 3 hæfter, tilsat lidt ekstra opskrifter - Sådan gør du! Nålebinding - Trøje - Sådan gør du! 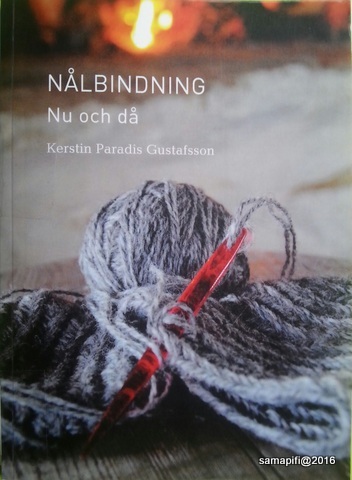 32 pages, A4-sized booklet, can be ordered via Leine Merino's web site (link), 120 NOK + postage (when I ordered it in 2011, the total cost was 24,40 e). Clear colour photos, instructions for a few stitches, and in addition, it is explained how to make variants (so 16 stitches altogether), decreasing, increasing, instructions for mittens, etc. Some of the instructions for stitches or stitch variants are ambiguous. E.g. "To-plukk med vri" stitch is called Dalby Stitch (Russian Stitch Family, 1+1+1), but the instructions and photos show another stitch, Turning Stitch 1+1+tr. In the instructions for stitch variants it is not always obvious to which direction the needle should be 'turned' (vri, vridd), that is, should one turn the needle towards 8 o'clock (as in Russian Stitches), or towards 4 o'clock (as in Turning Stitches). The direction of the needle, however, affects the final result significantly. The list of stitches at the end of the booklet may be best read with a bit a cautiousness. For instance, the "Dalby Stitch" has a correct Hansen's code listed (UOU/OUOO), although the instructions and the photos show another stitch (one of the Turning Stitches). The "Pyöräyttäen" stitch, on the other hand, has the Hansen's code of one of the Russians Stitches (2+2+1, with a plaited edge), although the instructions and photos show the "Pyöräyttäen in the Parikkala style" stitch. 120 pages, soft cover, bit smaller than A4 size, lots of colour photos, can be ordered at least via Amazon (note, the book is a "book on demand", meaning it will be printed only when ordered, so although the stock shows 0 pcs, you can still place your order). Instructions with colour photos for Oslo Stitch, Mammen Stitch, Brodén Stitch, Dalby Stitch, York Stitch, and diagrams for a few other stitches. 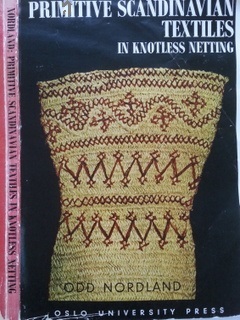 Also includes bilum (a netted bag from Papua New Guinea), splicing (several ways), history, catalogue of nalbinding finds in different eras, both b&w and colour photos of historical nalbinding items (note, the Tuukkala mitten (Finland), unlike mentioned in the list, is made in Finnish Stitch 2+2 (UUOO/UUOOO), and not Russian Stitch 2+2+3 (UUOOUUU/OOOUUOOO). Instructions on making one's own needle, choosing yarn, patterns for pouches/bags of different size, mittens, socks, etc.